Aurora Light Up Pen is prefect for note taking during slide presentations of lectures. Light up the tradeshow floor with this flashy giveaway! 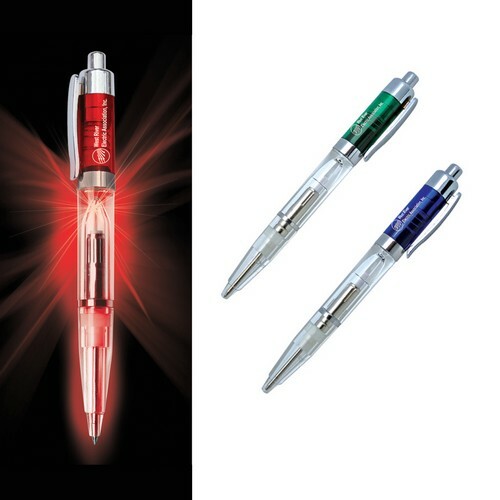 The Aurora Light-up ballpoint pen features a medium point, black ink and bright red LED light that's activated by pressing the top button. Light up the tradeshow floor with this flashy giveaway! 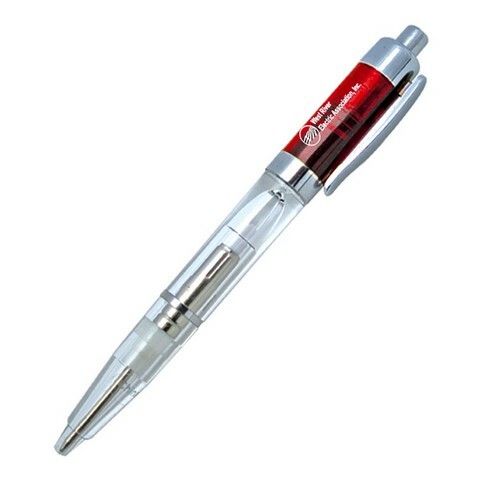 The Aurora Light-up ballpoint pen features a medium point, black ink refill and bright red LED light that's activated by pressing the top button. It also includes a lower barrel, twist-action release and 3 button cell batteries (battery life subject to individual use). Add a pad printed or silkscreened logo for maximum brand exposure wherever it's used! Each pen measures 5 5/8"L x 7/16" diameter. Bulk / 17 lbs / 350 pcs. / 10 x 14 x 14box.